Original vintage Civil War 6th plate size ambrotype by unidentified photographer. 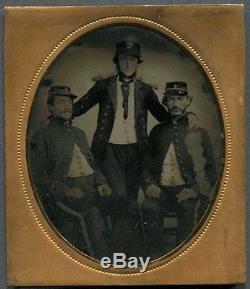 This is a studio view of three unidentified American Civil War soldiers. I suspect these are Union soldiers, but I'm not 100% certain of that. The seated men wear single-breasted shell jackets and kepis with the letter "A" on the front, indicating that they were members of Company A of some military unit. The standing man wears a double-breasted jacket with large metal epaulets. His cap reminds me of a naval cap, but I'm unsure. Please note that there is a vertical scratch and missing emulsion at the right side of the plate (visible in scan). Image is housed in a complete case that is detached at the spine. Wish I knew who or what these guys were. Overall Fair Condition and Guaranteed Original. See three scans for details. The item "6th Plate Ambrotype of Three Unknown Civil War Soldiers Union or Confederate" is in sale since Sunday, August 23, 2015. This item is in the category "Collectibles\Photographic Images\Vintage & Antique (Pre-1940)\Tintypes". The seller is "sadietex" and is located in Austin, Texas.